Share, Connect, Stay Informed! 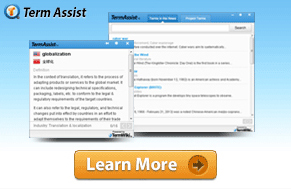 TermWiki Groups allows users to do all of that - as part of a global community! Group Detail: Anyone who interested in growing plants hydroponically welcome this group to discuss about hydroponically plant growing and share experiences. Group Detail: I would like us to use this tool as a Glossary for this unit. Group Detail: A group for Italian translators and Italian speakers. Un gruppo per i traduttori italiani e per chi conosce la lingua italiana. Group Detail: For the use of alumni, current students and employees of the University of Cambridge. Group Detail: We are a group of Vietnamese qualified linguists. Our services include translation+editing, proofreading, linguistic check (English-Vietnamese). Group Detail: A group created for OCPE translators. Automatically look up terms and translations in 90+ languages.